Learn more about partnering with Sprockets! Improve your work with youth! Learn how to share all your information with the Sprockets community! Successful Youth. Quality Programs. That's Sprockets. Sprockets is a strong network of after-school and summer programs for kids and teens in Saint Paul. 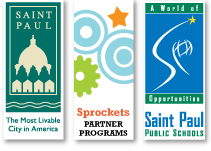 It’s a collaboration of community organizations, the City of Saint Paul and Saint Paul Public Schools. Copyright ©Sprockets, All Rights Reserved.